Tobii Technology Builds Eye-Controlled Asteroids Cabinet! 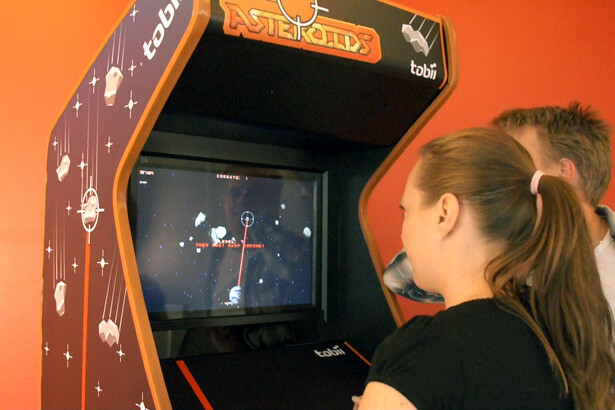 Tobii Technology has built a one-off Asteroids arcade cabinet, designed to showcase their eye-tracking technology. The game made its premiere at CeBIT in March, to demo eye-tracking on laptops. This is another step towards more natural human-machine interaction, and according to Tobii, much faster than hitting buttons or full-body motion sensors. The full arcade version of Eye-Asteroids makes its debut on Tuesday, November 8, 2011, at the Dave and Buster’s in Times Square, New York, before heading off on a world tour. Known stops are London in late-November, and Las Vegas at CES next year. The game is much closer to Missile Command than Asteroids, as you protect Earth from incoming ELEs (Extinction Level Events) by blasting them with lasers with your eyes. They could have used this technology to create Superman-Meets-Big-Buck-Hunter, but we approve of their choice. The game’s debut corresponds with Tuesday’s near-Earth encounter with a real asteroid, that will pass by closer than the moon. Read about that here. We’ll stop by Dave and Busters for a full review. Check back for that! Asteroid Buzzes Earth on Tuesday! On November 8, 2011, an asteroid named 2005 YU55 (hereinafter referred to as “Yolanda”) will pass .85 lunar distances from the Earth — closer than the moon! 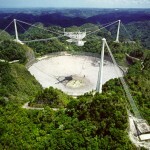 It has a 400 meter diameter, the size of an aircraft carrier, and is dark and nearly spherical. 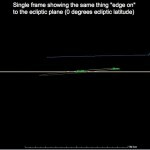 [Click the image above for an animated view of the asteroid’s path]. At its closest, Yolanda will be visible from the Earth’s southern hemisphere. 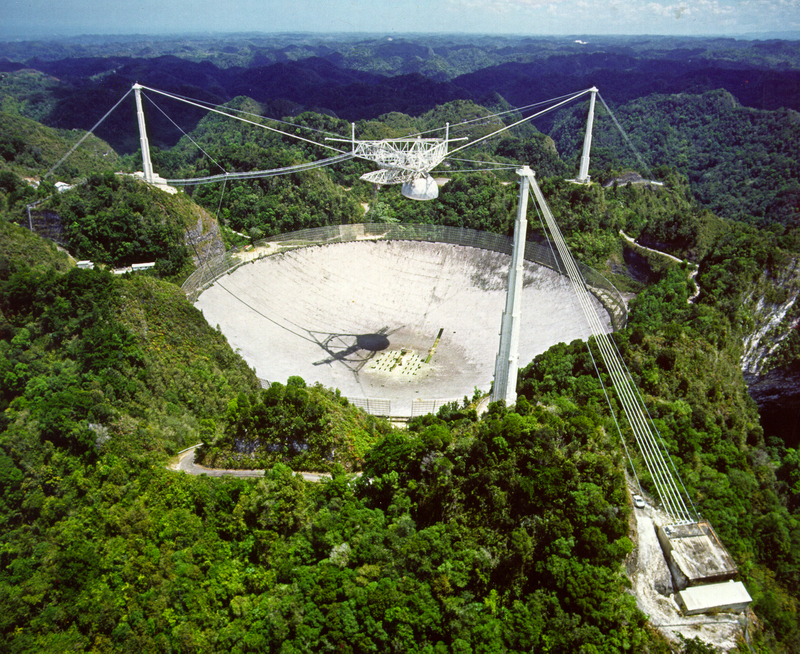 Officials are employing one of the coolest-looking telescopes — Arecibo, star of “Goldeneye” and “Contact” — to create an extraordinarily detailed image and 3D model of the asteroid as it zips by. Yolanda is classified as a “potentially hazardous object,” but it will not hit the Earth or moon. The only defensive action being taken on Tuesday is the introduction of Tobii Technology’s new eye-controlled version of Asteroids at Dave and Buster’s in Times Square. Read that story here. 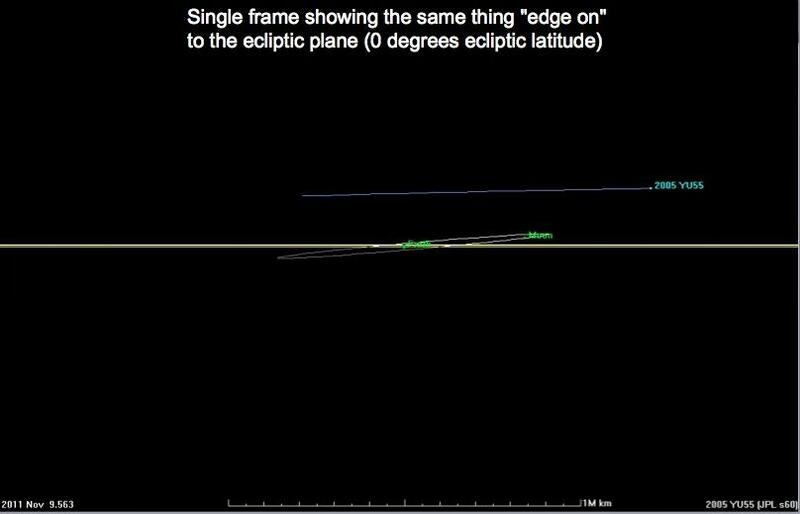 The next time an object will pass this close to Earth (that we know about) is 2028, when asteroid (153814) 2001 WN5 will pass to within 0.6 lunar distances. In the mean time, we recommend that you find your nearest Atari Asteroids arcade machine and do your part.